To err is human, but how do errors happen? And can assessments help reduce them? 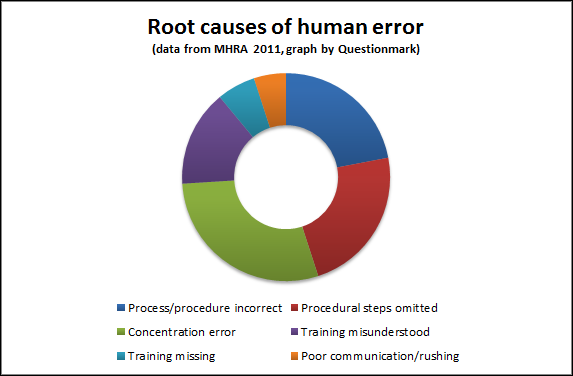 As part of my learning on assessments in health care, I’ve come across some interesting statistics on errors in UK hospitals by the Medical and Healthcare Products Regulatory Agency (MHRA). They have a system called SABRE which collects and analyzes errors in hospitals relating to serious adverse reactions in the area of blood transfusions and handling. Hospitals are encouraged to report errors so that better practice can be identified, and the MHRA gathered 788 human errors in 2011. The root cause of errors may vary in other contexts, but it’s very interesting to see this data and I suspect that these six areas are common causes for error in many organizations, even if the percentages vary. Taking things beyond the MHRA data (and without any MHRA endorsement), I am wondering where assessments can help reduce errors. Some errors happen because training is misunderstood. Perhaps the training covers the area but the employee didn’t understand it properly, can’t remember or cannot apply the training on the job. Perhaps the employee simply can’t remember the training. Assessments check that people do indeed understand. They also reduce the forgetting curve and can be used to give scenarios or problems that check if people can apply the training to everyday situations. Other errors happen because training is different to what the real job involves. Competencies or tasks needed in the real world aren’t part of the training or the post-training assessment. Job task analysis, using surveys to ask practitioners what really happens in a role, is a great way to correct this. See Doug Peterson’s article in this blog or mine on Job Task Analysis in Questionmark for more on this. For errors that happen where procedural steps are omitted, an observational assessment is an effective, pro-active solution. See Observational Assessments—why and how for more on this, or see my earlier post in this series on competency testing in health care. Such assessments will also pick up some issues for procedures or processes being wrong. What about the other 34% of errors that arise from concentration failures, rushing and poor communication, I am sure there are ways in which assessment can help and would welcome your comments and ideas.